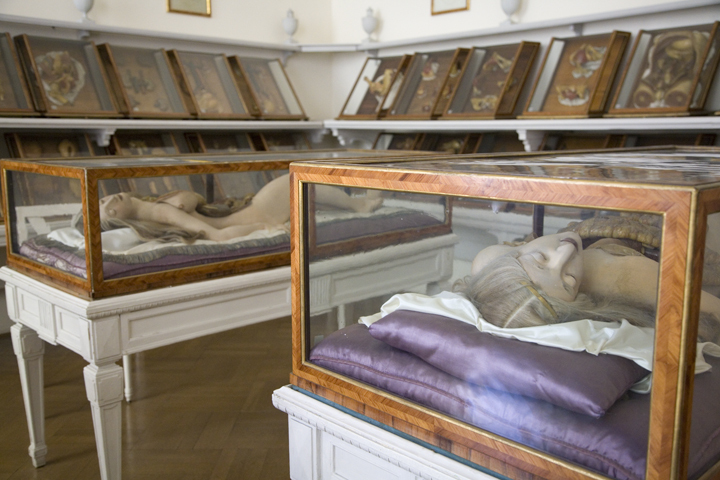 The Anatomical Venuses and Slashed Beauties created in the late eighteenth century by the studio at ‘La Specola’ Natural History Museum in Florence, Italy, under the leadership of Clemente Susini are the perfect specimens, though to refer to them as specimens or, indeed, even as ‘objects’ seems wrong-headed, besides the point, an insult to their utterly persuasive and enchanting corporeality. Better to refer to them instead – as do their keepers – as she, her, sleeping beauties, slashed beauties. Adorned with real human hair, glass eyes, golden tiaras and strings of pearls, these ladies recline invitingly in extreme states of anatomical undress on velvet cushions in fine Venetian glass and rosewood cases; bizarre to the modern eye, they intrigue and disturb, bristling with a subtle ontological confusion, flickering between the seemingly irreconcilable edges of life and death, body and soul, animate and inanimate, eros and thanatos, the real and the simulacrum, suggesting corporeal saints, science-age memento mori, CGI of the baroque anatomical imagination, the uncanny incarnate, beautiful death, incorruptible anatomized bodies swooning with voluptuous grace. 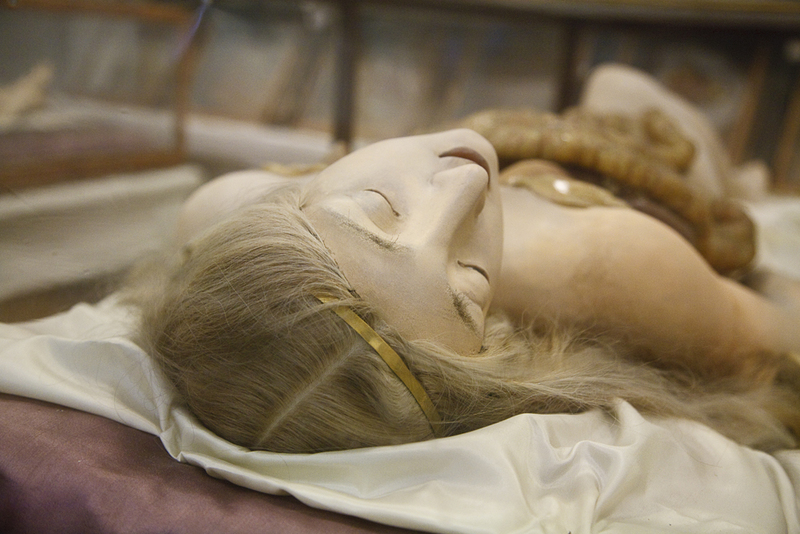 Each of Susini’s life sized anatomical wax ladies are awe-inspiring in their hyper-real verisimilitude and their stunning beauty; they are also cyphers, beckoning towards abandoned paths to forgotten – and perhaps forbidden – knowledge, evoking a lost past when God and science, medicine and beauty, body and soul, naturalia and artificialia, anatomy and metaphysics resided side by side without conflict in a single, perfect, and beautiful human creation.